If you have been following the latest tech news, you are probably aware that YouTube and Vimeo have launched HTML5 based video players. Their move to introduce HTML5 support garnered a lot of attention. YouTube even proclaimed that they are “very excited about HTML5 as an open standard and want to be part of moving HTML5 forward on the web”. However, the true story is somewhat different. YouTube’s HTML5 player is not as open as Google would have us believe. Before understanding why the new HTML5 video player does not work in some browsers, let us try to understand why HTML5 video is a big deal in the first place. One of the major problems with online streaming videos has been the lack of standardization. Some videos require Windows Media Player, some require RealPlayer, some utilise Adobe Flash while others require QuickTime. In order to view these videos, you must first install the appropriate browser plug-ins. However, HTML5 attempts to clean up this clutter by introducing the <video> tag. The basic aim of WHAT (Web Hypertext Application Technology) working group was to free online videos from plug-in dependency by introducing native video playback. Unfortunately, due to lack of agreement between major browser vendors, the video codec itself was not standardized. Apple wanted to use H.264 video due to better compression ratio and support for hardware acceleration. However, Opera and Mozilla refused to accept H.264 since it is a proprietary codec. This brings us to the current situation with YouTube and Vimeo. 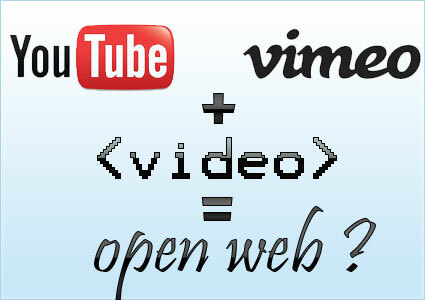 Both YouTube and Vimeo have decided to go with H.264, which is not supported by Opera and Firefox. Hence, although Opera and Firefox support HTML5 video playback, they are not compatible with the new YouTube player. The HTML5 player works only in Chrome, Safari and Internet Explorer with Chrome frame installed. So why is Opera and Mozilla opposing the H.264 codec, which is technically superior to the proposed Ogg Theora codec? The answer to this question is not as simple as you may think. H.264 is a proprietary codec and implementing a H.264 decoder would cost the browser manufacturers approximately $5 million per year. On top of that, even content creators would be liable for loyalties starting. The problem is not just financial; it is also ideological. Mozilla Firefox is an Open Source product, which is modified and used by various downstream distributors. Including proprietary code within the product will prevent these distributors from implementing a fully functional version of Firefox. YouTube’s decision to choose H.264 is both startling and puzzling. Chris DiBona of Google claimed that, “If [youtube] were to switch to theora and maintain even a semblance of the current youtube quality it would take up most available bandwidth across the Internet.” However, this is nothing but FUD (fear, uncertainty and doubt). Xiph found that the video produced by using Ogg Theora is comparable to the one produced by YouTube’s own H.264 video encoder. Ogg Theora was able to match both quality and size of the video outputted by YouTube’s encoder. Not only that, Ogg Theora clearly has a greater reach (mainly due to Firefox). DailyMotion was one of the early adopters of HTML5 and it has already demonstrated that Ogg Theora can be successfully used on a large scale. I can’t understand google going this way unless they are trying to force people into Chrome… I think Mozilla is right in sticking with Open Source. Basically every heavyweight in the industry is trying to throw his/her weight around to leverage the new market. Why cant we go with the wonderful .ogg format? .-= Shaunak DeÂ´s last blog ..Setting Up the Canon iP1700 printer for use on Fedora Linux =-. It’s clear Google trying to get maximum browser market using this trick. Let see what happen next. .-= Arafat Hossain PiyadaÂ´s last blog ..Automatic discover lyrics on iTunes with iTuner =-. .-= S.Pradeep KumarÂ´s last blog ..15+ Tips To Optimize Images For Search Engines =-. Remember reading about H.264 vs Ogg debate on Mozilla’s blog a while ago. Its all about corporate grip hold again. But its true if they are going for a standard and its being back by Google i would hope it will be an open standard and not a propriety one. I tried the HTML5 video beta on Youtube , the quality was pretty bad compared to flash. .-= AmanÂ´s last blog ..Poem Exercise =-. Can’t believe google is doing this. Never knew why this happened! Now I understood thanks.. I thought that there is some plugin issue, but now I know that it is lack of proper standardization. .-= Rohit SaneÂ´s last blog ..15 old HTML tags not supported by HTML 5 =-. One question! How will a proprietary codec and implementing a H.264 decoder would cost the browser manufacturers approximately $5 million per year? .-= AshfameÂ´s last blog ..Setup FeedBurner to tweet new posts to Twitter =-. The simple answer is royalty fees. Check out the link I had included in my post ( http://html5doctor.com/youtube-and-vimeo-support-html5-video/ ). However, there have been some more developements since my post. The H264 foundation has announced that they won’t be charging royalty fees till 2016 (check this no. as I am pulling it out of my head). Also, Google has announced that it will opensource VP8, which is an excellent codec. I am hoping that all browser manufacturers can agree on VP8 as the standard. I pretty much agree with everything you’re saying. But I feel the need to point out that H.264 is an open standard which may or may not have patent encumbrances. That’s different than a proprietary codec like On2 which Google is now going to make open source as well. I was finding the reason why HTML 5 video is not working in my firefox browser. Now I got the reason for it. It is a bit unbelievable that Google can do this to increase users of Chrome. Not all videos are not working on FF and Opera.. Most are working fine.. The ones with the older format.. I will not help Google wine this way.. I’d rather not watch the video ! To funny i thought it was an issue with my PC glad to know its just the browser causing the issues. I use Opera. It’s really bad to use proprietary hardware or software.